Click a location on the map to go to a port. Lake St Clair lies between Lake Huron and Lake Erie. It is connected to Lake Huron by the St Clair River and to Lake Erie by the Detroit River. This lake/river system is one of the busiest waterways in the world. With over 5,000 ships transiting each year, it is busier than both the Panama Canal and the Suez Canal combined! Both the lake and the river were named by French explorers in 1679 after St. Clair of Assisi. Along with the Detroit River, the system is actually a strait as it joins two large bodies of water and lies between two large landmasses. The St. Clair River flows south from Lake Huron for approximately 40mi / 65km. The current ranges from 3.5 kts to 6.0 kts but can vary considerably due to lake levels. The shoreline is heavily industrialized and signs of heavy industry, especially the petrochemical industry, are quite evident. However, away from the river, on either side, the land is predominantly agricultural. Lake St Clair is a very shallow lake which can make for some quite challenging situations for a sailor when the wind pipes up. The largest delta system on the Great Lakes is located at the north end of Lake St Clair. The Detroit River flows south from Lake St Clair reaching Lake Erie 28mi / 45km downstream. The river is named from the French “du detroit” or “of the strait”. There are islands in the Detroit River, the majority of which lie within US territorial waters. They are mostly small and uninhabited. This river system has been a vital transportation link between the upper and lower lakes. Before the arrival of Europeans, the waters were plied by native Americans. This was naturally followed by the French fur traders and explorers. Antoine de la Mothe, Sieur de Cadillac built Fort Ponchartrain du Detroit in 1701 – today's modern city of Detroit. 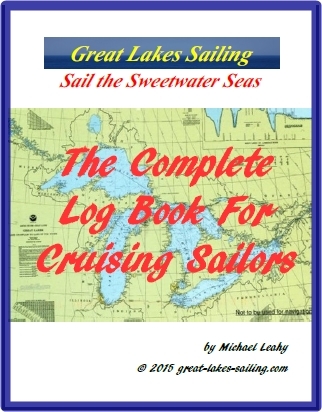 Today, the Lake St Clair system is a vital link in the St. Lawrence Seaway system and, as noted above, is the busiest shipping waterway in the world. Sailors will find quite a contrast between the urban areas around Detroit – Windsor and the quiet reaches of the northern delta. There are about 2 dozen ports and harbours along this waterway. They offer everything from the hustle and bustle of major cities to quiet little harbours tucked away from the busy shipping channels. Maintain a listening watch on VHF 16. This is where you will hear “securité” calls given by vessels about to leave harbour, warning of impending manoeuvres, and ferries departing port. If you are in the immediate vicinity of a ship issuing a securité call and are unsure of what to do, call them on VHF 16 and ask them what they are about to do and what you should do in response. They would prefer that to a silent guessing game with a small vessel 'jinking' around them. Commercial radio traffic occurs on VHF 11 above the Lake St Clair Light and VHF 12 below the light. Most commercial traffic will also monitor VHF 16 although not required to do so. Monitoring VHF 11 and 12 can give you a good indication of what is happening with the commercial traffic in the channels. It can be especially helpful if you are making a night passage or are caught in fog. Most of the navigation channels marking the length of the Lake St Clair system are designed for commercial traffic. Depths can get skinny and maneuvering room is tight for the big ships. Those limitations don't generally apply to pleasure craft so you can easily move outside of the defined channels. However, a word of caution is in order. ALWAYS refer to your charts before doing so. Without care, you can find yourself in dangerously shallow water in no time at all. For example, look at Gull Island where the water goes from 27ft / 8m to 2ft / .6m or south of Fawn Island where it goes from 30ft / 9m to 1ft / .3m. THAT could ruin your day! Canadian Aids to Navigation are numbered with a 1 or 2 letter prefix – i.e. "AM3". American Aids to Navigation are numbered without a letter prefix. For a more detailed explanation of Aids to Navigations, click here. There are only 2 bridges on the main route from Lake Erie to Lake Huron – the Ambassador Bridge at Windsor-Detroit and the Bluewater Bridge at Sarnia-Port Huron. These bridges have significant air draft and would pose no problems for recreational sailors. There are a number of bridges on secondary channels and rivers. These usually need to be opened to allow passage and are marked on charts. On approach, signal the bridgemaster with 1 long, 1 short blast (in the US) and 3 long blasts (in Canada). In an emergency, sound the danger signal – 5 long blasts. There are several cross-river ferries on both the Detroit and St. Clair rivers. They are marked on charts and need be approached with caution. Take a close look at these ports - tremendous contrasts within easy distances.